Where have I been? Well let's see.. Where to begin? At the beginning!..Christmas was spent very quietly this year. As most know my husband had his entire spine reconstructed in November. All our Christmas decorations and tree are in the shed way up high where I can't reach and the boxes are too heavy for me to lift and bring in so we didn't have anything in the house which was fine with me for this year. With all thats been going on with Mr L's recovery it would have just been more for me to have to deal with.. I spent time in prayer, worshiping our Lord and Savior and oddly enough while I would have loved to have had my tree and things up and gifts under the tree I had a really nice Christmas. My mind was completely on Jesus this year. Nothing else. There was nothing to distract me from His wonderful conception and birth. It was very nice for me. I was going to go to Mass both Christmas eve and Christmas day but it seems the crud has taken hold of me and of course it had to happen on Christmas Eve so I was unable to make it to either Mass which was a very big disappointment for me. In the last week this 'crud' or whatever it is has taken it's revenge on my sinuses and I've had a migraine for 3 straight days now. Worst part is it seems no matter what I take, it's not helping the pain. My doctors office is not open so I will have to wait until the middle of next week and see if I can get an appointment when they reopen. I did manage to push myself out the door on Friday. I was bound and determined. I went into my closet on Christmas Eve morning (before I started to feel horrible) and looked around. All I have is warm weather clothing and maybe 2 sweaters for cold weather. Well guess what? It's finally gotten downright cold here in the South. Finally! but I have nothing to wear and I also needed a coat.. So Friday morning I pushed myself to go to Goody's Department Store near my home and get a few cold weather pieces. I had a $10.00 gift card that Goody's sent me for Christmas, plus I had two 20% off coupons from their FaceBook page that I printed out.. After about an hour of shopping around in the store I finally came out with two sweater dresses, one warm long sleeve top, a pair of tights and a nice fitted jacket that was $89.00 marked down to $39.00.. I am happy with the pieces I picked up because they are pieces that won't go out of a style for at least a few years. I've changed my shopping habits in the last year. 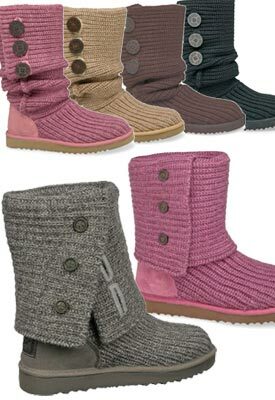 Instead of going for 'trendy' I find that I now want quality pieces that will last and be in style no matter what the calendar says..
Do any of you own a pair of Uggs? I tell ya, I've wanted a pair of these for a while now but I just couldn't justify spending $160.00 or more on a pair of Uggs. I could not bring myself to do it so lately I've been looking at all the knock offs that are out there for much much cheaper prices.. Well on Friday morning before I left for my retail therapy, the mail person rang my bell with my mail.. I was shocked because this woman never ever gets out of her car unless she ultimately has to. She had a box in her hand addressed to me. Of course, I got excited wondering what was in it.. I opened it up and to my very huge surprise there was a pair of Uggs in there! and it was the kind I've been wanting!.. My sweet nephew bought me them for Christmas. He remembered me loving his girlfriends when they were here January of 2012 and so my loving boy bought his aunt her very own Uggs.. I was so stunned.. These are the ones he got me in gray.. I wore them out shopping on Friday and now I understand all the rage about these. They are SO comfortable!.. The inside has like sheep fur or something in them so you don't need socks and it was like walking around in my slippers the entire time I was out.. I was so thankful but you know, more than the boots, what really means the most to me about this gift is not the shoes themselves but the fact that my nephew who is only 24, has a very busy life of his own, doing his own thing, remembered that I liked and wanted these and that he would spend that kind of money on me just to see me happy.. That means more to me than all the money or Uggs in the world. I Love you Eric! 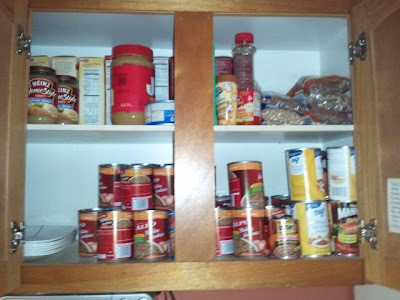 Today although Im still not feeling well by any means I needed to do something than lay around feeling horrible so I decided it was time to take inventory in my pantries, freezers and refrigerator. I am bound and determined to save money on our food bills this year. Everything has gone up and who knows how much further it will go, on the news they are talking about possibly $8.00 a gallon for Milk! If that happens we will be drinking powdered milk. So, I started my inventory this morning. I got almost all of it done, just had to check the refrigerator and freezer in the kitchen. What I did learn by writing down everything we have including spices etc. 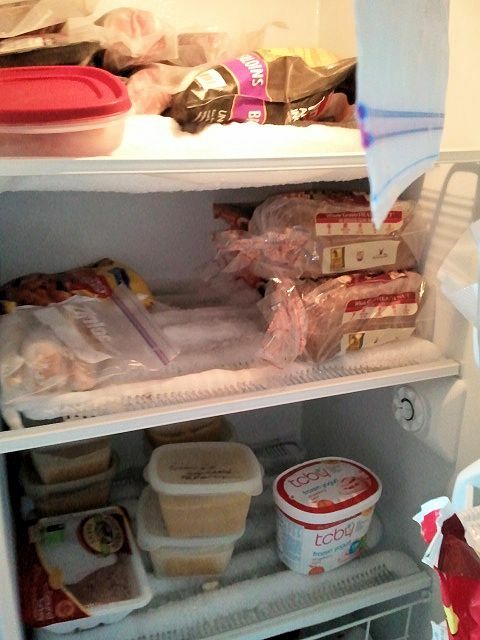 My husband has enough meat and things for meals for more than a month!. 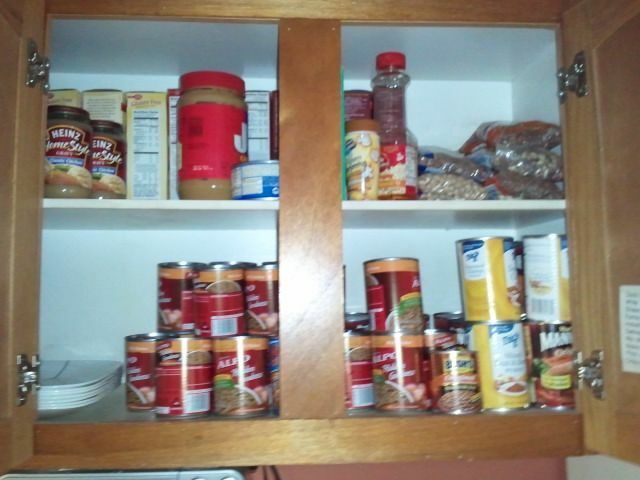 So we will be eating out of our pantries and freezers for January and maybe even February. I will still have to get the staples we use every month like dog food etc but for main meals and side dishes, we don't need a thing.. Here are some photos of me taking stock this morning.. This is my big freezer in our utility room. It may look a little empty but I wasn't able to get it all in the photo and trust me, there's plenty of meat in there. 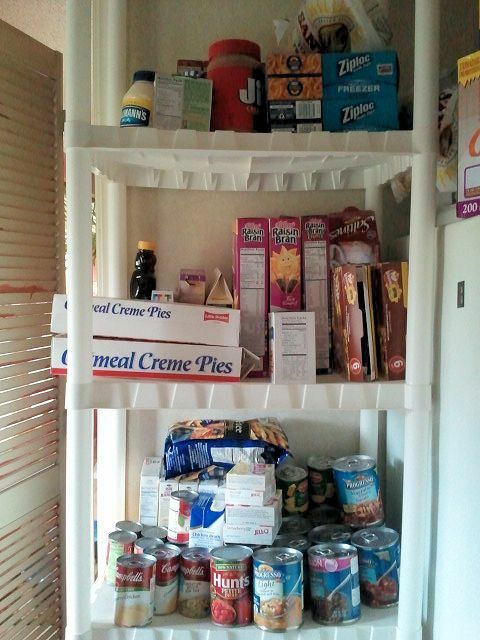 This is my shelving in the utility room next to the freezer for my stock piling. Again, only a few of the shelves are in the photo. There's plenty on these shelves to get us through. 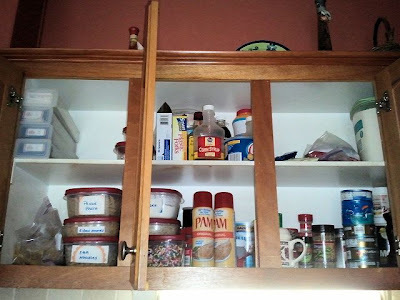 These are two of my pantry shelves in the kitchen. I have another one full of coffee, side dishes etc but the photo didn't come out. On the same Friday I went to Goodys and received my Uggs I also received a huge blessing in the mail as well but I'll write about that tomorrow ..